Days Of Darkness Festival 2017 will take place at Rams Head in Baltimore, MD, USA on October 28-29, 2017. 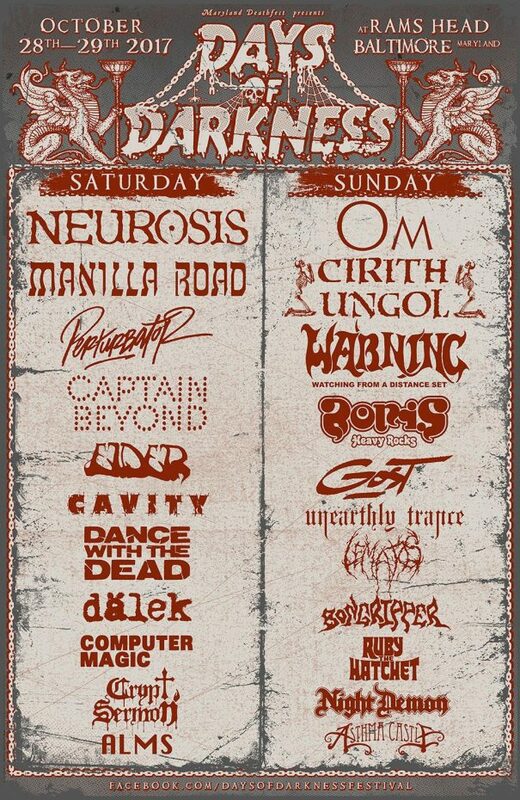 Neurosis, Manilla Road and Warning are among the bands that will perform at Days Of Darkness Festival 2017 festival. Motocultor Festival 2016 will take place in St. Nolff, France on August 19-21, 2016. Testament, Neurosis and Gorod are among the bands that will perform at Motocultor Festival 2016 festival. High Voltage will be held in Victoria Park, London, England on July 23-24, 2011. Judas Priest, Dream Theater and Anathema are among the bands that will perform at the High Voltage 2011 festival. Ruisrock Festival will take place in Ruissalo, Turku, Finland, on the first weekend of July, the exact dates being July 3-5, 2009. This year’s festival will be headlined by masked metal band Slipknot (USA), indie rock group Mew (DEN) and heavy metal band Disturbed (USA). The 12th annual Tuska Open Air Metal Festival takes place in its near legendary location of Kaisaniemi on July 26.-28.